Having covered the South Jersey dining scene for some time, one thing I’ve learned to be true is that our area loves Italian food. It’s the reigning cuisine of the local counties, thanks largely to our seasonal tomatoes producing some of the best sauces and gravies you could ask for. So when I hear talk of an exciting new Italian eatery, I pay attention. My ears perked up after hearing of La Polpetta, one of Gloucester County’s newest restaurants serving up Italian-American fare with experience to boot. Chef Nicholas Tomasetto—formerly of Arugula in Washington Township, a much-loved Italian restaurant that closed in 2017—is the man in the kitchen. Tomasetto went on to open Zuppetta Italian Kitchen for a short period of time in 2017 before rebranding to its current namesake La Polpetta recently. It’s a cozy 34-seat space with a simplistic modern dining area that is homey and inviting. The room’s floor-to-ceiling white curtains that fall all over the walls provide the perfect dose of intimacy while limited décor and clean tables leave the food to truly shine. La Polpetta is Italian for “the meatball,” so it’s safe to say that house-made meatballs are a major hitter on this menu. Along with a variety of meatball sandwiches, the kitchen also features a full selection of meatball varieties to start your meal. The Porketta Meatball reminded me of a deconstructed roast pork sandwich: tender pork meatballs are mixed with provolone cheese and served on a bed of chopped broccoli rabe, then smothered in a rich provolone fonduta sauce. The meatballs themselves had a crispy exterior that added a nice texture alongside the soft greens and creamy sauce, and the sharp flavors of cheese and broccoli rabe were cut just enough by the mild ground pork. Aside from the meatball starters, the rest of the appetizer portion of the menu was a seasonal celebration, especially a dish of eggplant caprese. Thin-sliced eggplant was oven roasted and plated alongside house-made marinated sundried tomatoes and pesto, then rounded out with orbs of mozzarella cheese, arugula and a drizzle of balsamic vinegar and Parmesan. The oven-baked eggplant was a new preparation for me, with a slight chew that created almost a meaty feel that stood up alongside the acidic sundried tomatoes. The mozzarella acted like a background player alongside the bright flavors of the veggies and pesto, all of which stood out thanks to their freshness. You can take your pick from a variety of pasta dishes, but we chose to play to the at-home vibe in the room and order a plate of Sunday Macaroni (served all week long). It comes with a massive serving of long ziti noodles, tossed in house-made tomato gravy and finished with olive oil and crispy breadcrumbs. Alongside the pasta is a bowl of specialty meats, including their classic meatball, Italian sausage, and shredded short rib, all sitting in that same tomato gravy. The sauce was beautifully fresh, bursting with flavor and the perfect shade of vibrant red. This second meatball was just as tender as the Porketta, and the unique ziti noodle helped make this a fun take on Sunday dinner. 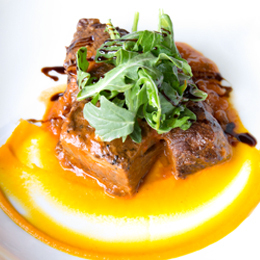 The braised short rib was a delicate serving of tender black Angus beef, served over a swipe of carrot puree with arugula and red wine reduction. The stand-alone beef was rich, but was in desperate need of an addition to the plate. A side of Parmesan fries helped break up the dish and seemed to be a fan favorite in the dining room that night, arriving at almost every table with aromatic rosemary and a garlic aioli for dipping. They helped make the short rib dish feel complete, though an added touch would have helped make the entrée feel truly whole. Desserts—like the rest of the menu—are made in-house and simple, but enticing. A slice of lemon cake features layers of white cake and white icing, topped with a custard-like lemon icing and finished with a rich raspberry sauce. Lemon and raspberry are such familiar flavors for a reason; they just work together. This cake in particular remained light and fluffy, with just the right smack of tart lemon, cut with the help of icing and sweet sauce. Here in South Jersey we take our Italian food pretty seriously, so it’s a nice surprise when a place like La Polpetta does the exact opposite. Tomasetto’s menu was playful and fun; giving diners the familiar flavors they love with just the right amount of creativity and originality. It’s nice to see Tomasetto back in the kitchen, and if this trip to La Polpetta was any indication it looks like he has no plans to slow down any time soon. Published (and copyrighted) in South Jersey Magazine, Volume 15, Issue 5 (August 2018).